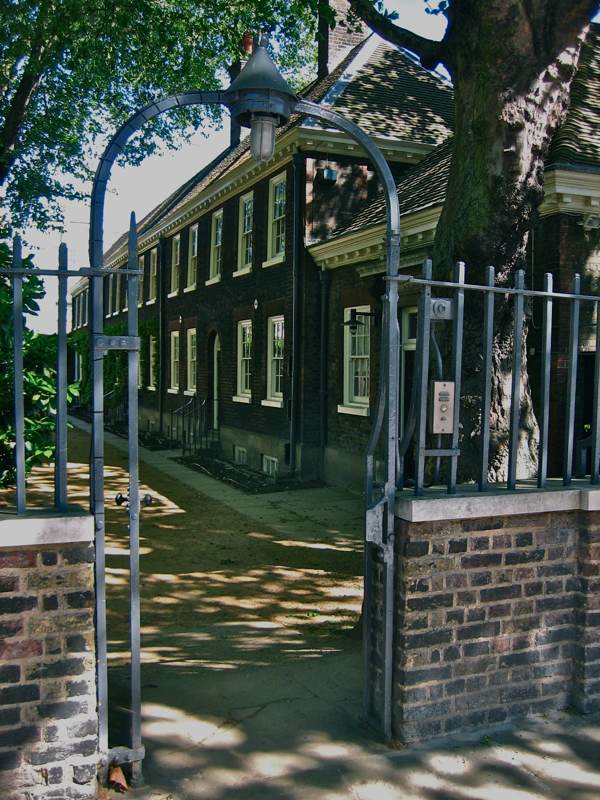 On the day of the launch of The East End Preservation Society, I tell the story of how the Geffrye Museum came to be founded as the outcome of a row over the proposed redevelopment of the Ironmongers’ Almshouses in the Kingsland Rd a century ago. 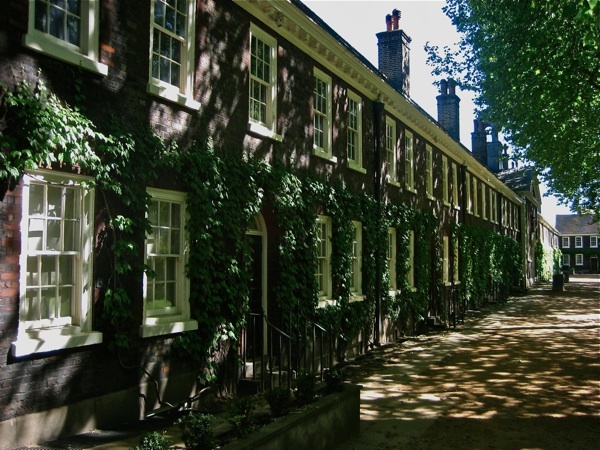 The Geffrye Almshouses – obvious potential for redevelopment? Discovering a dusty, hundred-year-old file of letters labelled ‘Ironmongers’ Almshouses’ in the archive of the Society for the Protection of Ancient Buildings in Spital Sq recently, revealed to me the long struggle that took place a century ago to save the buildings which house the Geffrye Museum today. It was a curious experience – both heartening and disappointing in equal measure – to recognise that history repeats itself, as the same arguments are used to justify sacrificing the past, requiring tenacious conservationists to jump through endless hoops to avert destruction of important edifices. How many of the best-loved old buildings only exist today thanks to the efforts of long-forgotten campaigns to save them. There were once many ancient almshouses to the East of London but, as the city spread and streets were built around them in the nineteenth century, many were sold by their charities and moved beyond the capital. In fact, the two notable remaining examples - Trinity Green in Whitechapel and the Geffrye Almshouses in Haggerston both owe their survival – at least in part – to the intercession of the Society for the Protection of Ancient Buildings. 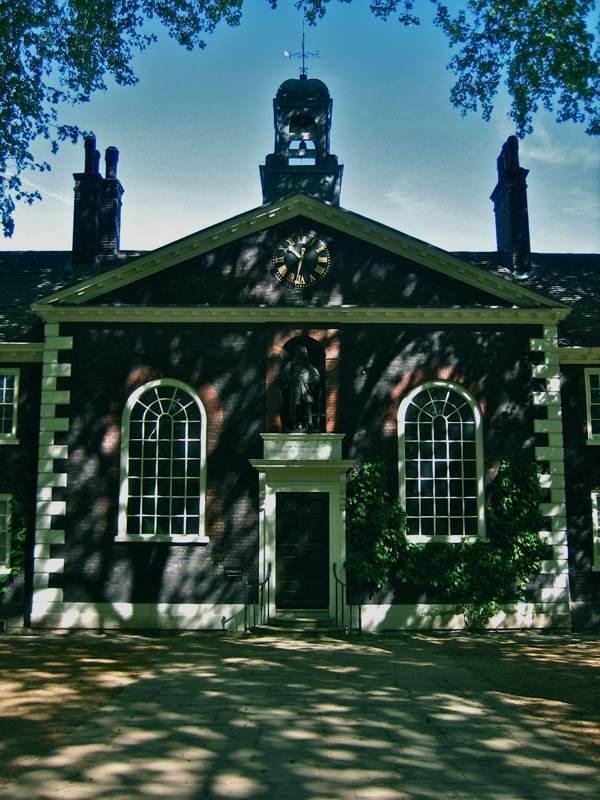 Perhaps it was because of its wide lawn facing the busy Kingsland Rd that the Geffrye Almshouses continued as a secluded haven for its senior residents long after others in the vicinity had gone. Yet at the end of the nineteenth century – as today in the East End – rising land values became a threat to these venerable buildings of the school of Wren that enshrined an important social endeavour within a gracious aesthetic. The first hint of the approaching storm came in January 1893, when the Almshouses’ trustees applied to the Charity Commission seeking permission to spend capital upon necessary repairs and were refused. “The Commissioners would suggest the desirability of selling the site of the present Almshouses … to secure the necessary balance of income and expenditure,” came the reply. Yet five years later, the Commissioners reluctantly granted permission and the Almshouses’ future appeared secure. But in 1899, the Shoreditch Vestry wrote asking if the Ironmongers’ Company had considered selling the site and supplemented their enquiry with a veiled threat of compulsory purchase. 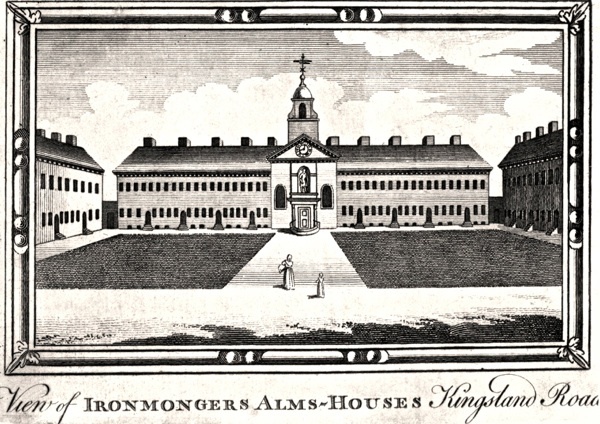 They intended to demolish the almshouses to construct an Electricity Generating Station on the site. Only the intervention of the Society for the Protection of Ancient Buildings and the National Trust won assurances from the Ironmongers that they would not sell the Almshouses, and the Power Station was built nearby in Pitfield St. “To replace this sweet and peaceful spot with hideous works is an act of vandalism unworthy of a vestry which has hitherto been in the van of progress,” wrote Septimus Buss, Vicar of Shoreditch. By now, the Ironmongers had acquired an appetite to realise the monetary value of their property and in 1906 they placed a notice in The Times advertising the site for sale to developers. They signed a provisional agreement with the Peabody Trust for £24,000 who planned to build tenement housing and – as with Mother Levy’s Nursing Home in Underwood Rd last year – Peabody had no interest in retaining or integrating the historic buildings occupying the site. This was in spite of a large petition by local people who wanted the open green space preserved as well as the Almshouses. Permission from the Charity Commission was required for the sale to go ahead and, in response to objections from preservation groups, they held a public enquiry. Justifying the case for demolition, the Ironmongers claimed a Surveyor had concluded “no expenditure short of rebuilding would put the buildings in a suitable condition as regards accommodation and sanitation.” As part of the case for relocation, they reported that dead cats were frequently thrown over the Almshouses walls and the old women complained of the horrible sights that were to be seen in the houses in Maria St adjoining. Arguing for preservation, Edwin Lutyens gave the case for the quality of the architecture and Dr Bryett, Medical Officer for Shoreditch revealed that out of six hundred and fifty-one acres in the borough, less than six were open land dedicated to public use. And, following the precedent of the Trinity Green Almshouses, which C.R. Ashbee of the Guild of Handicraft in Bow had campaigned to save ten years earlier, the Commission refused permission for the sale. The Ironmongers Company demanded an appeal in the Court of Chancery to which opponents were not admitted but where the report of the surveyor, appointed by the Attorney General, was read out. W.D. Caroë wrote, “Architecturally, I consider these almshouses an object lesson in how such buildings should be dealt with. It would be difficult to better them. I have little doubt that when erected they were considered as among the best of their class.” In spite of this, the Court granted that Ironmongers’ appeal had been successful and they were free to sell the property to Peabody, thus introducing more high-density housing to an area already over-populated. In the event, London County Council used its powers to buy the site of the Almshouses, lobbied by the Parks Committee. Their primary concern was to provide open space as a public amenity, creating children’s playgrounds and opening the site in 1912, without any plan for the use of the buildings. In 1911, a petition for a crafts’ museum had been presented to the Council, signed such luminaries as William de Morgan, Edwin Lutyens, Walter Crane, Richard Norman Shaw and Lawrence Alma-Tadema. The presence of the furniture industry in Shoreditch at that time made it an ideal location for such an enterprise and, displaying artefacts loaned by the Victoria & Albert Museum, the Geffrye Museum first opened its doors in the former Ironmongers’ Almshouses on 2nd January 1914. It was touching to read the emotional, hand-written correspondence of those who fought over nearly twenty years to save the Geffrye Almshouses, struggling to raise money to further their case and often admitting disillusion, continuing even when they believed their cause was lost. “Two charming old almshouses in the Kingsland Rd are now for sale and likely to be destroyed. I’m afraid it is hopeless to try to save them but that is for you to decide,” wrote one passionate correspondent, enclosing a cheque for the fighting fund in August 1906. “I fear there is little probability of our being able to save the buildings,” confirmed Thackeray Turner, Secretary of the Society for the Protection of Ancient Buildings in September 1906. Yet it was the enlightened vision and moral courage of those campaigners that ultimately led to the creation of the Geffrye Museum, and – as we approach the centenary of its opening in a few weeks time – I can only wonder what they might have made of the irony of this year’s battle in a similar vein to prevent the Geffrye itself from demolishing the Marquis of Lansdowne, an historic building in its own possession. What a fine name – Septimus Buss – and what a fine article contains it. The arguments used for a quick buck by the local vestry, & the Irnmongers’ Company, 107 years ago, & those of property “developers” today are totally unchanged, I note. As are the forces of hopeful enlightenment, ranged against them. But how sad for us that we have no intelligent final arbiter that will come down on the side of preservation. Everyone who loves London appreciates why the abolition of the GLC, the successor to the London County Council, was such a catastrophe for the whole of London. Both national government and local administration now serve to encourage and support the galloping metropolitan necrosis of destruction and so-called ‘development’ that we are witnessing, erasing the history and the archaeology as it goes. We badly need an East End Preservation Society! I urge everyone who reads Spitalfields Life who can, to come to the founding meeting this evening at the Bishopsgate Institute. This lovely and beautifully illustrated article just proves that nothing changes in the world of property development. Also shows how necessary organisations like SPAB and the new East End Preservation Society are. Incidentally, Septimus Buss was a brother of Frances Mary Buss who founded the North London Collegiate School – where I was a pupil back in the mists of time! excellent selection of cuttings and pictures to stoke up the passions that will be needed tonight and in the future to work at preserving the East End’s heritage kept alive in its buildings. As a young boy I spent many an hour wandering about in this museum with my father, I always enjoyed looking at the room setting’s, However, recently I paid a return visit, my first in over 10 yrs, and although pleased to see little change to the main layout and the room setting’s, I was anything but impressed with the modernized area, an ugly and awkward construction, totally out of character with the original building, and I found the contents of the new section completely irrelevant to the theme of the museum, in fact, completely pointless and a total waste of space. Did the launch go well? Oh, & you’ve made “Nooks & Corners” (Of the new barbarism) in Private Eye – well done!